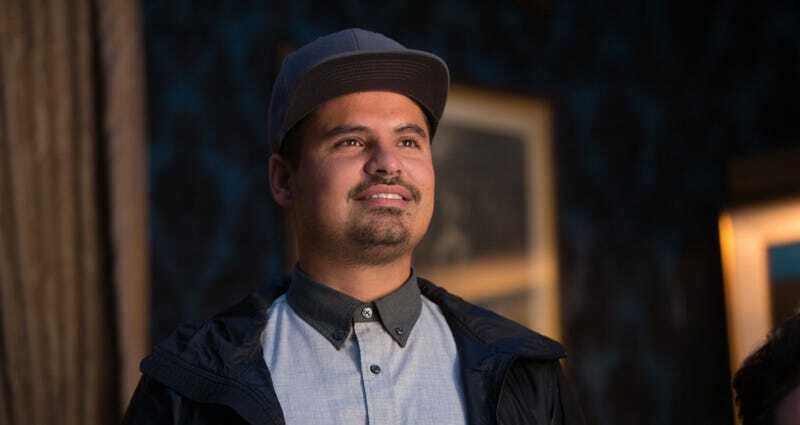 We’re long overdue for a film where Michael Peña gets to save the world. His upcoming role in C.H.I.P.s might be close, and he does consider Ant-Man a friend, but in his new movie Extinction, he’s going for the whole thing. The film, which was previously announced by Universal just picked up the rights to, stars Peña as a man who continually has dreams of his family dying. Then, when aliens invade, he realizes he has a special power to stop them. I have no idea how those two ideas line up but that’s the story according to The Hollywood Reporter. The script was written by the trio Eric Heisserer (Arrival), Spenser Cohen, and Bradley Caleb Kane, with newcomer Ben Young set to direct. Filming should start in April, well before Pena would get to work on Ant-Man and the Wasp (I know you were thinking about it! ), which isn’t out until July 2018. In film after film, Peña has proven his range and talent. He’s kind of been in every kind of project, from science fiction with The Martian, to war films like Fury, gritty drama like End of Watch, superhero movies, Oscar-fare, television, all of it. But he’s rarely, if ever, been a leading-man action star. That changes with Extinction, and we couldn’t be more excited for it.